The Wild Atlantic Way is a 2500km (1500 miles) driving route, stretching from Malin Head in County Donegal to Kinsale in County Cork along Ireland’s western seabord. It was launched in February 2014 by Junior Tourism Minister Michael Ring and it traverses the entire rugged and spectacular west coast of Ireland from Cork through counties Kerry, Clare, Galway, Mayo, Sligo, Leitrim to Donegal. In Mayo the Wild Atlantic Way is a 543km coastal drive and much of Mayo’s spectacular natural scenery lies along it. In Mayo there are thirty-one Discovery Points and two of them are indicated as Signature Points: Downpatrick Head and Keem Strand. Reading our mini-guide, you can travel the Mayo section of The Wild Atlantic Way or pick your part of the Atlantic coastline to explore. 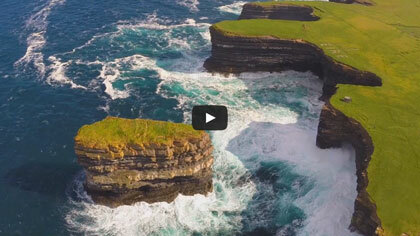 Downpatrick Head is one of the Signature Point on the Wild Atlantic Way and commands breathing views on the Atlantic. A magnificient rural and shelterd beach on the east on Achill Island. Killary Harbour, An Caoláire Rua in Irish, is the Ireland’s only fjord, which forms a natural border between counties Galway and Mayo. Carrowmore Strand is a machair beach set between a rocky outcrop in a small bay off Clew Bay. Old Head beach, near Louisburgh, is overlooked by a woodland to the west and Croagh Patrick to the south. Murrisk view point is located on the south shore of Clew Bay at the base of Croagh Patrick, adjacent to Murrisk Abbey. Clew Bay (in Irish: Cuan Mó) is the most spectacular bay in Ireland. This elevated discovery point offers open and panoramic views south and south east across Clew Bay. 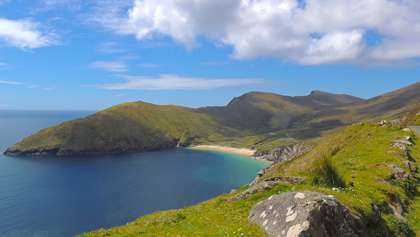 Ashleam Bay offers one of the most breathtaking views on Achill Island. Keel Beach is one of the most popular and magnificent sandy beaches on Achill Island. Doogort Beach, sheltered by the magnificent Slievemore mountain, is also known as Golden Strand. Elly Bay is an area of great scenic beauty and tranquillity in North West Mayo. Fallmore is a town-land near Belmullet with Blacksod Bay to the south and east, and the Atlantic. Blacksod Harbour is a working harbour with an accompanying lighthouse, Blacksod Lighthouse. Annagh Head, on Mullet Peninsula, is one of the most ancient site on the Wild Atlantic Way. Erris Head is at the top of the Mullet Peninsula. This Dicovering Point offers some of the most dramatic coastal scenery on the Wild Atlantic Way. The Céide Fields, near Ballycastle, certainly gives you a unique experience. Lacken and its bay nestle along the rugged North Mayo coastline, between the towns of Killala and Ballycastle. Killala (in Irish: Cill Ala) is a picturesque seaside village six and a half miles north-west of Ballina. Situated at the entrance to Clew Bay, Clare Island is the largest of the Mayo offshore islands. Claggan is a tiny island off Achill. It is the newest Mayo’s island having only being declared an island in 1991. Inishturk, meaning “Island of the Wild Boar”, is a quaint beautiful island located 14.5km off the coast of Mayo. Inishbiggle or Inis Bigil is located between the mainland and Achill Island. Iniskea islands are situated on the west coast of the Mullet Penisula and they are rich in amazing scenic and rare wild life. Enniscrone Beach stretches for 5km over a long area of shoreline between Cliff Road and the mouth of the River Moy. Easkey Discovery Point offers wonderful views over the Atlantic and on to the Slieve League and Benbulbin mountains. Nowadays Letterfrack village is better known for the Connemara National Park. This Discovery Point is a lovely sandy beach located on the north coast of the Renvyle Peninsula. The Sky Road Discovery Point in one of the most spectacular points on the Wild Atlantic Way south of Co. Mayo. Derrigimlagh Bog is a spectacular blanket bog near Clifden. Bunowen Bay boasts a lovely white sandy beach on the Slyne Head promontory. From gentle walks along the coast to the more demanding day out on Croaghan, Achill’s highest mountain.